Time to get serious. 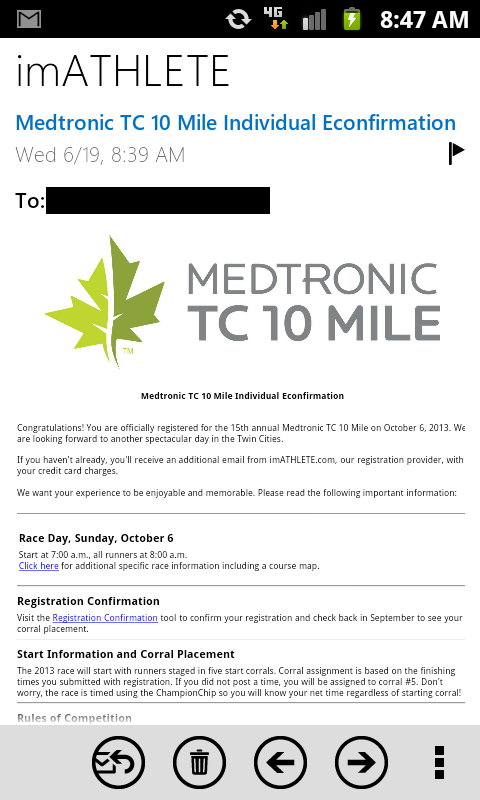 I'm officially registered for the Medtronic TC 10 Mile, thanks to the guaranteed entry I got for running the TC 1 Mile in May. I read somewhere that running a fast half marathon requires the endurance of marathon training with the speed of 5k/10k training, so I would expect training to be similar for a fast 10 miles (fast being a relative term). Problem is, I have no idea how to do this. High mileage and lots of speedwork? Gross. I've already committed mentally to a goal which I'm pretty sure is a long shot, given my current running fitness and the fact that this race is a mere 15 weeks away, but someone once said if your dreams don't scare you, they're not big enough. So this is me*, looking at my goal. And no, I'm not making it public yet. Tonight: Running with the Gabrielson family. Their baby is already faster than me. haha love that gif! You'll do great and kick some booty!